Asbury Park City Hall is located at One Municipal Plaza, Asbury Park NJ 07712; phone: 732-775-2100. Photo: Houses on Sunset Drive, facing Deal Lake, Asbury Park, NJ. The Allenhurst Residential Historic District was listed on the National Register in 2010. David Ames, Photographer, 1991, Historic American Buildings Survey [HABS NJ-1006], memory.loc,gov, accessed February, 2013. While Asbury Park began as a Methodist religious resort, the town rebelled against its religious beginnings, quickly becoming a successful secular enterprise that brought a new liveliness to the north Jersey seashore. By the late nineteenth century Asbury Park had become one of the Jersey shore's most popular resorts, later developing a year-round clientele. Today, few visitors to Asbury Park would ever suspect the town originated as a religious resort. Across the bridge over Wesley Lake, a neon sign atop a tall office building advertises "liquors." The building stands just down the street from now abandoned Palace amusements, lacking the "P," facing empty parking lots. Only Asbury Park's fame lives on to suggest a more illustrious past. The area just north of Ocean Grove was developed in 1871, and by 1878 Harper's Weekly described both resorts in a single article. Our readers will notice that the central sketch gives equal prominence to Ocean Grove and Asbury Park. The latter enterprise owes its inception to the energy of a single individual, Mr. James A. Bradley. Asbury Park soon grew into a populous summer city. At present, it has two church edifices, hotels, boarding-houses, stores of every variety necessary, a weekly paper, a post-office, a public hall and in the center of the Park, Educational Hall. James A. Bradley, a Manhattan brush manufacturer, hoped his resort would instill religious principles and encourage moral temperate living. He named the town after a human embodiment of such ideals, Francis Asbury, the first Methodist bishop in America. An Ocean Grove Camp Meeting vacation inspired Bradley to purchase 500 acres for $90,000, supposedly in an effort to keep the land from those less religiously inclined. Insuring that "no bad influences might encroach on the adjoining camp meeting," the New York businessman wrote restrictions against alcohol into Asbury Park property deeds. While Ocean Grove maintained its self-righteous demeanor, Asbury Park rebelled against the ideals of its founders, quickly becoming a successful secular enterprise that brought a new liveliness to the north Jersey seashore. "Stimulated by the fiery influence of ice-cream and ginger-pop, its permanent and floating population may plunge into the vortex of social dissipation afforded by pool, billiards, bowling, smoking and dancing," Kobbe reported. By 1890 Asbury Park housed a summer population of 30,000, with a permanent population of 4,000, taking its place as one of the shore's popular resorts. The religious Bradley may have coincidentally increased Asbury Park's secular popularity when, as a member of the New Jersey legislature, he arranged passage of a bill banning gambling. As a result, Asbury Park siphoned off much of the wealthy clientele of nearby Long Branch when the law closed down that resort's popular Monmouth Park horse racetrack. Away from the ocean, along Cookman Avenue, a business district gradually grew to become the major retail and commercial hub of Monmouth County, a role it would play until the advent of shopping malls well into the twentieth century. Stores here sold stoves, newspapers, pumps, meat, fruit, candy, and tobacco by the 1870s. In 1887 New Jersey's first electric trolley—America's second-was operating! By 1897 shoppers had such easy access up and down the shore that the Steinbach Brothers confidently built a multi-story, brick and stone, department store—a scaled-down, seaside version of the great emporiums John Wannamaker and R. H. Macy had built in Philadelphia and New York. For years Steinbach's flyers proclaimed the store, "the world's largest resort department store." By the early twentieth century, Kobbe's prediction had long since become a reality. The temperance advocate's ideals were forgotten in a scramble to develop the area into a substantial city from the revenues of a hardy tourist trade. Hotel advertising and the city's promotional booklets continued to depict a Victorian seaside resort. Trees had matured along streets where many year-round residents occupied well-proportioned Foursquare and Colonial Revival houses. As early as 1910, the city's mayor predicted a new "airship" link to New York, and the following year, the city fought for the right to permit trains to stop at the station on Sundays. Construction of the monumental pseudo Spanish-style Monterey hotel along the boardwalk in 1912 foretold of a new resort on a larger, more flamboyant scale. However, it was James Bradley's death in 1921 that released land for redevelopment and enabled the city to take off. 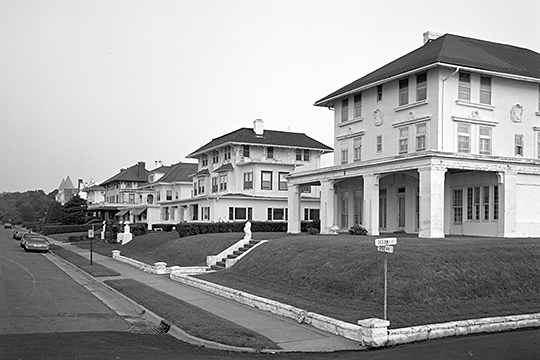 In 1926, the brick Colonial Revival Berkeley-Carteret hotel opened as a year-round business. Vacationers arriving in Asbury Park in the 1920s strolled along a crowded boardwalk lined with shops and anchored by two impressive secular buildings-a festive casino and an elegant convention hall, which were heated in winter by the mausoleum-like central plant that sits at the foot of Wesley Lake. While other Jersey shore resorts declined after the railroad boom, Asbury Park was able to evolve still. "Asbury park offers you welcome — welcome to the year 'round playground of the inviting Atlantic Coast," declared the text in a 1938 souvenir folder. As a haven of escape during troubled times, Asbury Park prospered during the Great Depression. Postcards depicted a crowded, colorful and well-kept boardwalk, offering candy shops for the sweet tooth, teahouses for the thirsty, and miniature golf to sate the recent putt-putt craze. Noisier games were found at Palace Amusements on Wesley Lake, next to the Mayfair Theater. The latter was a bizarre, eclectic-revival pile, floodlit at night to resemble a movie set. Today the lot at Lake Avenue and St. James Place is empty, overgrown with weeds. On September 14, 1944, a hurricane, that damaged the boardwalk and destroyed a number of concession buildings prompted city fathers to redesign the waterfront. A consulting firm was called in, on the advice of New York's powerful parks commissioner, Robert Moses. They urged Asbury Park to clear away most amusements, tear down the casino, and adapt to the automobile age with "parking fields" for 1,800 cars behind the boardwalk, a scheme partially implemented. By the 1950s Asbury Park, "while much changed from 1920," was still acknowledged "as the Duchess of the North Shore," one chronicler of New Jersey reported. During the 1960s, the city suffered from a loss of commercial momentum as well as tourist trade. Race riots in the later part of the decade dealt the local economy a severe blow from which it has not recovered. Though attention was again focused on Asbury Park in the 1970s through the lyrics of Bruce Springsteen, which describe its dilapidated condition, the Boss' rock 'n' roll prominence was not enough to revive an entire city. The tourist attractions remaining in Asbury Park only dimly recall more exuberant times. Surrounded by weed-ridden parking lots and dilapidated commercial buildings, the once-famous amusement park is now abandoned. Rows and rows of parking meters anticipate crowds that never arrive. A half-finished condominium development facing the boardwalk suggests one unsuccessful solution to the city's complex problem. In 1986, an optimistic tourist guide predicted that such projects would encourage the rise of a new Asbury Park, living up to its early reputation. "The $550 million redevelopment plan will give Asbury Park a chance once again to become a thriving community and make it practically unrecognizable in ten years to those who recall only neon lights and the all-night sounds of rock 'n' roll. " Five years later, the city still awaits the arrival of this plan and its accompanying crowds. † Prepared by: Alfred Holden HABS Historian Summer 1991. This project was sponsored by the New Jersey Coastal Heritage Trail (NJCHT) of the National Park Service, Janet Wolf, director. The documentation was undertaken by the Historic American Buildings Survey (HABS), Robert Kapsch, chief, under the direction of HABS historian Sara Amy Leach, project supervisor. Three historians completed the research during summer 1991: Field supervisor Sarah Allaback (Massachusetts Institute of Technology), Alfred Holden (University of Vermont), and Camille Gatza (North Carolina). Historian, Elizabeth Harris May (George Washington University), edited the HABS reports. Historic American Buildings Survey [HABS NJ-1006, memory.loc.gov, accessed February, 2013.